At seventeen, Tom Miller smashed his car into a tree, killing his brother only four hours before he was scheduled to marry Claire Shetler. Unable to live with his father’s bottomless grief and anger, Tom left the Amish church, ran away, and joined the Marines. Twenty-seven years later, Tom returns to Mt. Hope, Ohio, a wounded, decorated Marine helicopter pilot, and rents an apartment over Claire's workshop. A widowed Amish midwife, Claire is struggling to support her family, and despite her unresolved anger toward Tom, she sees the money as a Godsend. She never dreams that she will end up falling in love with a battle-scarred soldier. As Claire and Tom fight their way through the traumas of the past, they discover the tender mercies God has hidden along the way—one of which is a loving father who has been praying for his prodigal son to come home. 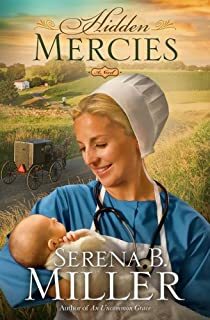 I enjoyed this novel that brings together the wounded combat vet and the Amish midwife. I'm not sure how realistic it is as most of my knowledge of the Amish comes from books like these but I have a hard time seeing such an insular society taking in strangers as happens in this book. In some ways though this story reaches beyond the Amish/English world and shows the universality of the struggles between spouses, the struggles between parents and children and the struggles of aging. It shows how forgiveness brings people together and how not forgiving hurts both the one who should forgive and the one who needs pardon. Thanks to the publisher for providing a complimentary review copy.